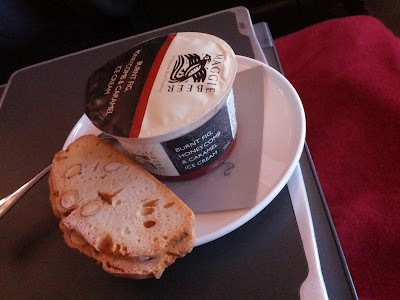 Perth Hacks - best tips, hints and bargains: What do you get with Qantas Perth-Sydney Business class ticket? What do you get with Qantas Perth-Sydney Business class ticket? I upgraded a flight from Perth to Sydney and thought I would post something I would have liked to have read whilst deciding on the upgrade. Here is what you get with a Business Class ticket in point form. Perth Qantas Club Lounge - I only got to the airport about half an hour before the flight was to take off so by the time I was clearing security, they were already announcing the boarding of my flight. I only had time to have a quick walk through the Business Lounge, grab an apple juice and walk out. The Lounge was pretty impressive and there was quite a lot of food and drinks available. The coffee was disappointingly from an automatic coffee machine, whereas in Virgin they have a barista ready for your order. There is plenty of room to perch yourself on a desk with a drink and work on your laptop. It was impressive but not outstanding. You are also allowed to invite someone else in to the lounge who is also flying on the same Qantas flight. Also there does not seem to be any restrictions about what time you can enter the lounge on the day of your flight so go as early as you can. Boarding - Apart from those requiring special assistance, you are the first to board and the first to disembark from the plane. Food - You get to eat your meals with elbow room using real cutlery. 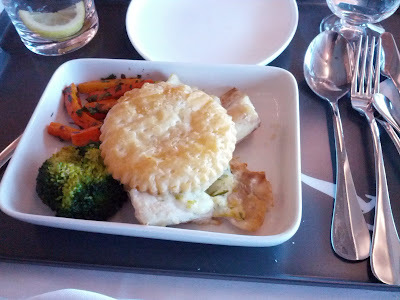 My lunch started with a tasty mushroom soup, a snapper pie with vegetables and ice cream served with biscotti. Entertainment - The headphones provided actually allow you to watch in-flight movies without needing the subtitles and are wrap-around headphones rather than cheap earphones. You can also plug in your thumb drive and listen to music from there but that you can also do on most Airbus planes now. Service - In Business class, they have a greater eye for detail such as promptly coming to ask if I would like to have my coat stored away just as I was taking it off. Seating - One comfortable feature was the seats installed in Business Class which can be adjusted to be a flat bed for sleeping. It is, however, still a little awkward lying in your 'bed' if you are on a midday flight. The seats allow you to adjust the top, middle and bottom of the back rest as well as the seat length and the pitch of the seat and foot rest. Problem is, I spent quite a bit of time on the flight trying to move the foot rest back down. You also get a decent blanket and pillow to keep you comfortable throughout the flight. Beginner's Guide to Business Class.